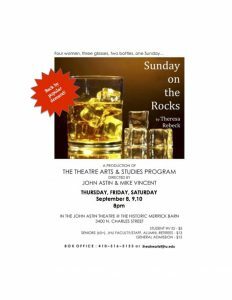 Four women, three glasses, two bottles, one Sunday… The Theatre Arts and Studies Program presents Sunday on the Rocks, a play by Theresa Rebeck. Directed by John Astin and Mike Vincent. Sept. 8-10 at 8 p.m in the John Astin Theatre at the historic Merrick Barn. See the poster for more information.